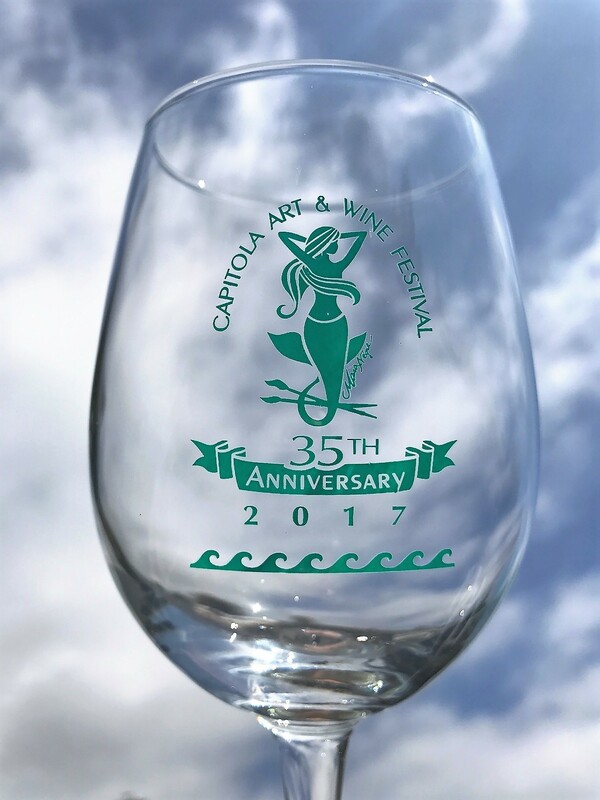 Get ready to sip and stroll by the ocean this weekend – the popular Capitola Art & Wine Festival returns to the Monterey Bay for its 35th year. 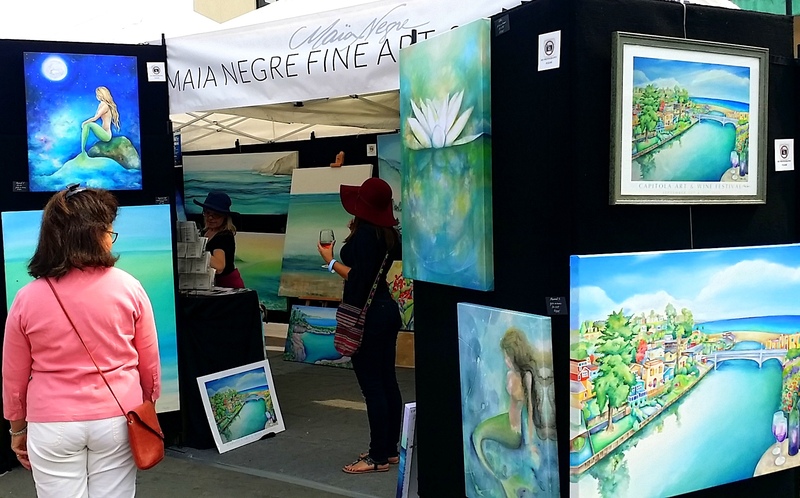 Distinguished by its charming beachside setting and non-stop activities, the annual Art & Wine Festival offers free admission and a fun, family-friendly event of creativity, culinary arts and community. 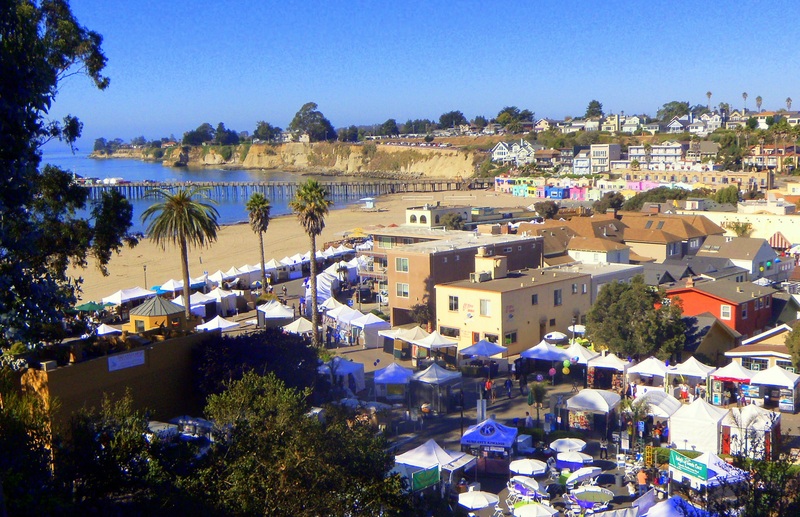 The Festival spreads throughout Capitola Village and combines high quality artwork, award-winning local and regional wines and microbrews, gourmet cuisine, and Bay Area music and entertainment. The Festival exhibits a juried show of high quality original work from 160 talented artists representing diverse mediums. Nothing pairs as well with perusing works of fine art as sipping exceptional wine. Guests can admire the artwork while tasting from the 22 participating Santa Cruz Mountains wineries, providing a selection of wines to sample, including Chardonnay, Merlot, Pinot Noir, Sauvignon Blanc, and Syrah. The iconic mermaid logo used on wine glasses back in 1989 has resurfaced this year through the artistry of local painter, Maia Negre – Maia’s classic aquatic image was chosen as the 2017 Festival glass design. Wine tasting requires a purchase of 2017 Festival Glass and Tasting Tokens. Glasses are $12 each, and will be available to purchase from any of the six Glass & Token Booths conveniently located throughout the Festival. Tasting tokens are $1 each, with wine tastings varying between 2 – 4 tokens per tasting depending on your wine choice. When hunger strikes, the Festival Food Court, located on Monterey Avenue, will be serving up tasty ethnic and traditional cuisine from around the county, including local food trucks Holopono and Saucey’z, as well as vendors Bill the Oysterman, Falafel of Santa Cruz, Happy Dog Hot Dogs, and India Gourmet. Capitola Village also offers a wide range of restaurants to satisfy every palate. Visit the Local Artisans Marketplace, held in the Capitola Mercantile Parking Lot with entrances on Esplanade and San Jose Avenue. 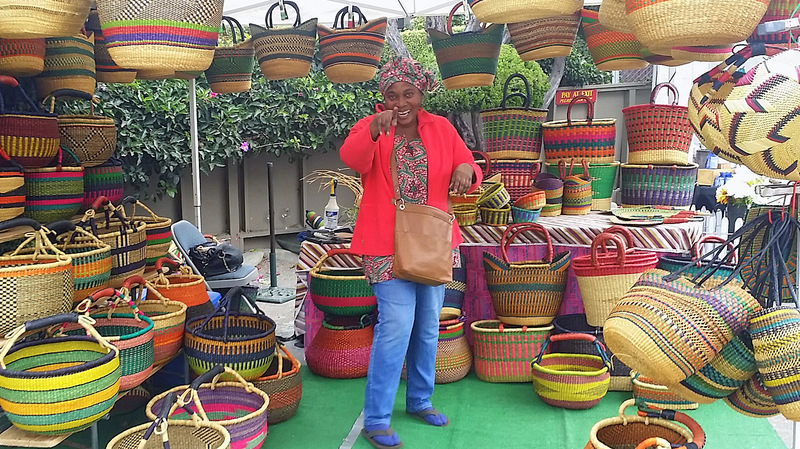 The Marketplace is filled with handmade crafts and artisanal treats, locally created and ranging from hand woven baskets and repurposed scrap wood to body products and pastries. 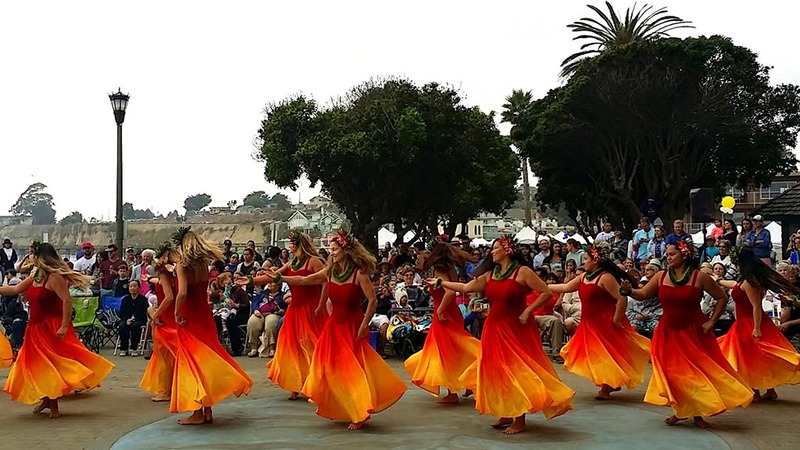 Te Hau Nui Hula Tahitian dance performance. The two-day Festival will also be flavored with local favorites providing ongoing entertainment for all ages. The line up includes dance and performing arts groups, street performances from The Great Morgani and The Surfing Magician, and live music from Extra Large, The Lost Boys featuring James Durbin, and The Fundamentals. To inspire the younger crowd, the Festival is hosting a Kids Art & Music Area located in the center of the Festival on Lawn Way, with ongoing craft projects as well as musical play featuring MusicalMe. 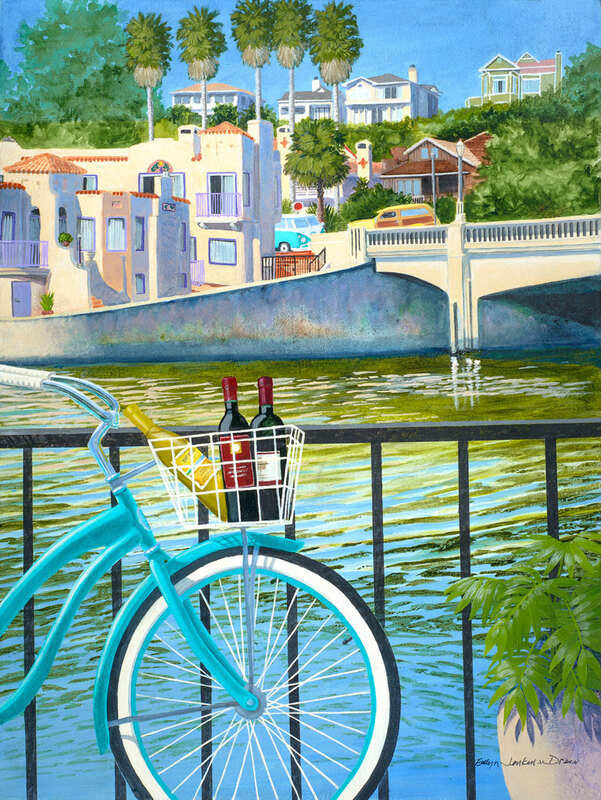 Visit capitolaartandwine.com for more information. Join Castagnola Deli and Cafe seven days a week for sandwiches, grab and go beach boxes, amazing chowder and more! HUNDREDS of Lightning Bolts Could Have Awakened Sea Serpents!